Official Narrative Does Not Ask The Hard Questions. Why? Now that everyone has had time to read or listen to the official narrative about the alleged suicide of Michael C. Ruppert you may find yourself, as you read this report, asking why the official narrative didn’t include these relevant questions and red flags. 1) The scene of my Michael Ruppert’s alleged death was handled as an unattended death by suicide and not as if foul play could have been involved. Consequently his blood was only tested for common substances such as Benadryl or alcohol. Extensive testing for uncommon substances, such as GHB or Scopolamine, was not done. The body was cremated without undue delay. 2) The identification of Michael Ruppert’s body was made by one man, the executor of his will, after dark by flashlight by eyesight, with the NAPA Sheriff’s coroner present. No effort to identify the body by fingerprints, DNA or dental analysis was made. Again, the body was cremated without undue delay. 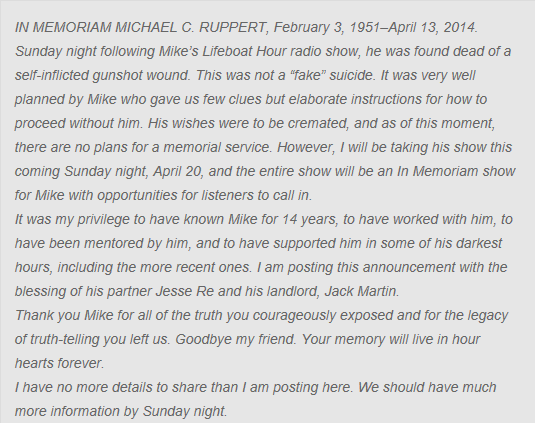 3) Within 48 hours of Michael Ruppert’s alleged death ‘close friends’ announced it was suicide by his own hand and asked the public not to spread rumors and/or conspiracy theories. An official cause of death had not been ruled and no toxicology report had been completed. How could they be sure Michael Ruppert had not been drugged? How did they know for certain he was not dead of something else before the gunshot to the head? 4) We are asked to believe what Michael Ruppert’s ‘close friends’ say about the events surrounding his alleged suicide because they are his close friends. But if an undercover FBI agent can successfully infiltrate the ‘Outlaws’ biker gang for 8 years before making arrests isn’t it possible agents had infiltrated close to Michael Ruppert? Can we trust his ‘close friends’? e) isn’t it possible Michael Ruppert wrote the final email willingly if one considers the possibility of a hoax. c) written willingly if one considers the possibility of his alleged suicide being an orchestrated hoax. Michael Ruppert had just returned from Seattle where he was interviewed for something that might later go on ‘mainstream TV’ as a series or two-hour special. He mentions FOX News and CNN. He was upbeat about his new gig and he was pleased to have a new source of income. He mentioned on his final broadcast he was under contract. He was very much in love with an attractive, younger woman. 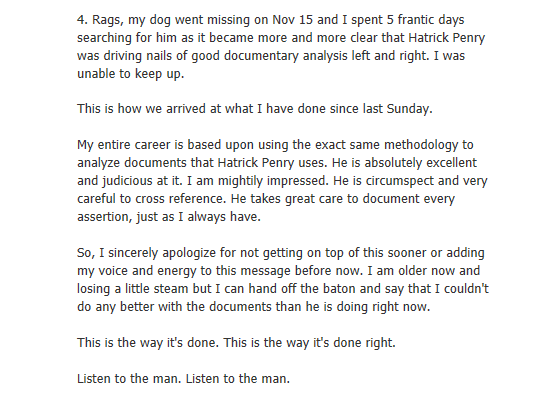 He was crazy about his dog ‘Rags’: just months prior to his alleged suicide he halted his entire life for 5 days when his canine went missing. When he found Rags he resumed his life. interviewing friends, acquaintances or former band members and asking if they knew anything or had any suspicions etc. The simple fact is I would be unable to write this article had the case of Michael C. Ruppert’s alleged suicide received a full investigation as if the possibility of foul play existed. Why did his ‘close friends’ not insist on this? It is difficult for me to believe his ‘close friends’ did not think to mention to investigators the possibility that the C.I.A. might have assassinated Mr. Ruppert and staged the scene to look like suicide. 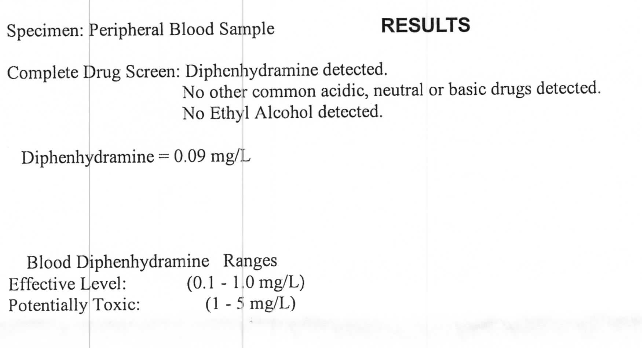 It is difficult for me to believe his ‘close friends’ did not feel the need to have extensive testing of his blood for uncommon drugs such as Scopolamine or GHB. If they really wanted people not to spread rumors and conspiracy theories wouldn’t the prudent thing to do have been to insist on a detailed and full investigation including extensive blood work right from the start? Shouldn’t the F.B.I. have been notified immediately? Again, we are talking about a man who could have been assassinated by the C.I.A. for exposing their involvement in drug dealing and money laundering, is it possible these people do not understand the capabilities of such an organization? 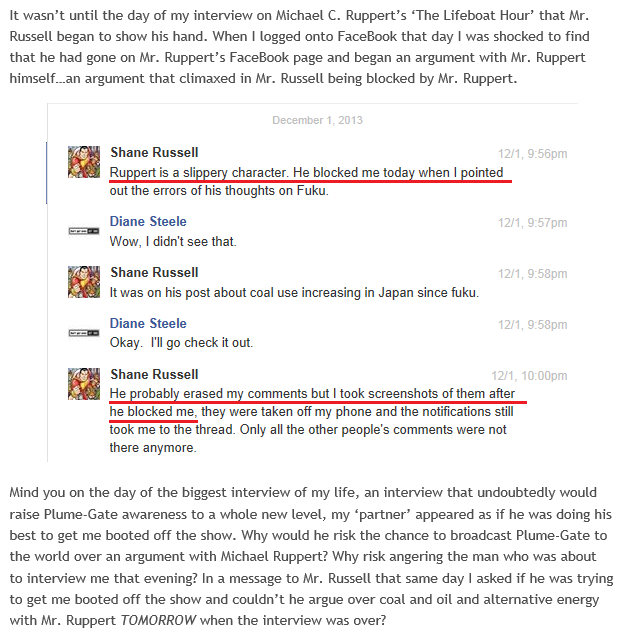 Perhaps we will never know the truth about the alleged suicide of Michael C. Ruppert. Perhaps we are not meant to. But it is my hope that this article will cause those that accepted the official story as truth to begin to question it, to begin to doubt it, as I have since the beginning. Only by casting doubt on the official narrative can we have a chance of forcing a real investigation by State or Federal authorities. And anything less than a full investigation would be to dishonor a man who spent his life exposing government corruption at great risk to his personal health. 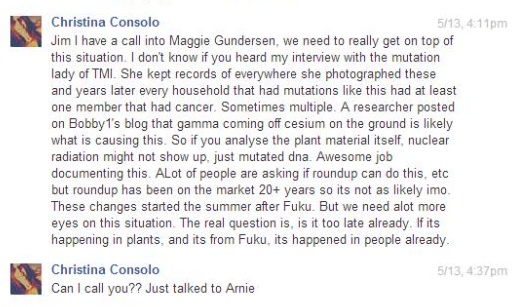 Several months prior to his alleged suicide Michael C. Ruppert was assisting me in reporting on the world’s largest provable cover-up: Plume-Gate (if you are unfamiliar with this grandiose multi-agency cover-up I link to my abstract and free eBook at the end of this article). 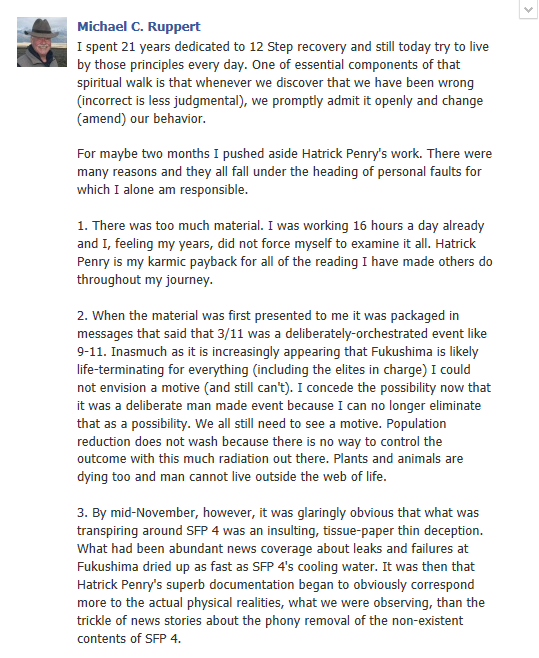 He also helped me bring the fight to the hoax ‘anti-nuclear’ movement. 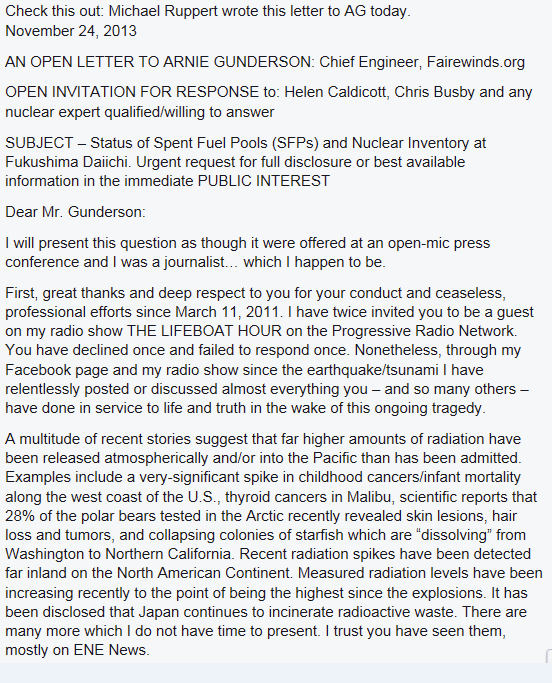 The bogus ‘anti-nuclear’ movement refuses to acknowledge the contents of these documents and instead appears to be performing ‘perception management’ on the American public. 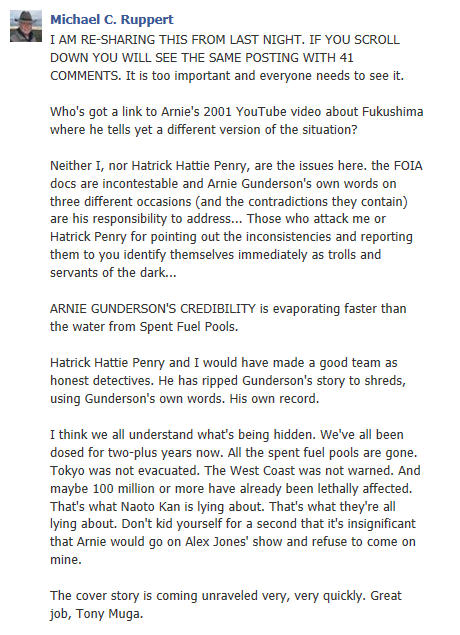 To this day there continues to be a full media blackout on Plume-Gate and the NRC FOIA documents pertaining to Fukushima. 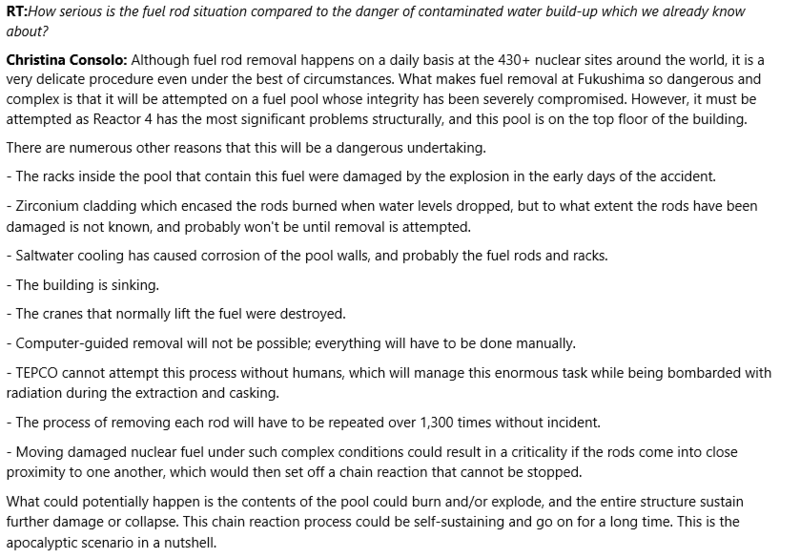 Plume-Gate is much bigger than 9/11 and it is all provable. Multiple agencies participated and the cover-up goes all the way to the office of the President. A study was done that projected 1.3 MILLION AMERICAN FATALITIES by the year 2030. Michael Ruppert was bringing awareness to these subjects and I suggest to you it is something that a man of his level of attention and contacts (members of Congress were known to be on his mailing list) would be silenced over. Plume-Gate is something the establishment wishes to hide from you forever if possible. 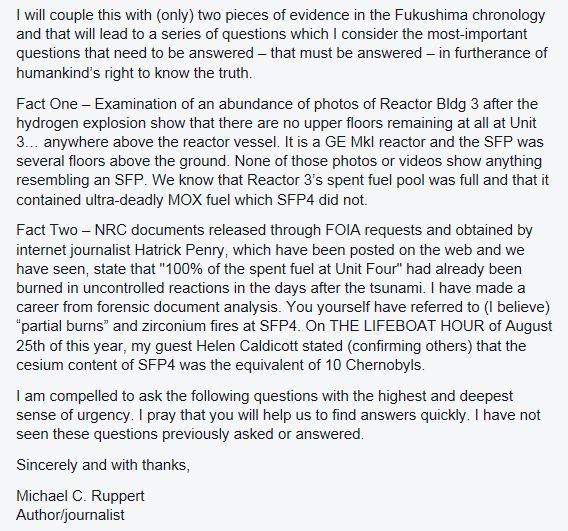 Author’s Note: To my knowledge none of those asked to answer the questions in the post above ever did and interestingly enough, they still won’t do what Michael Ruppert did: cover Plume-Gate and the NRC FOIA documents pertaining to Fukushima. Why? 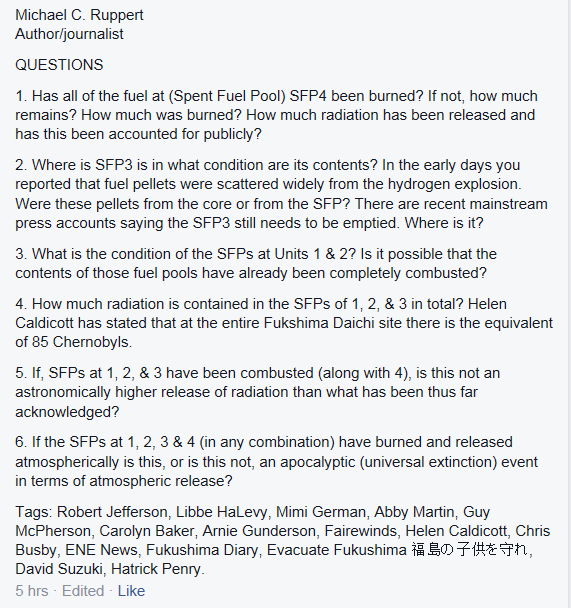 Posted on September 11, 2015, in Michael C. Ruppert 'Suicide' Investigation and tagged 9/11, collapse, crossing the rubicon, fukushima, michael c. ruppert, michael ruppert, michael ruppert suicide, plume gate, plumegate, the life boat hour. Bookmark the permalink. 2 Comments. Ah! A CIA targetted individual “commits suicide”… and BEGS… that his body be cremated… QUICKLY!! Oh, yes. Happens all the time. Anyone who believes that… well, perhaps we should change the saying of “with friends like these who needs enemies” to “with ‘close friends’ like these who needs enemies”. I mean, perhaps we should give the benefit of the doubt that they were simply simpletons – morons – who dearly, dearly loved this man… and were SURE that the “detailed instructions” he left including “cremate my body quickly so no detailed autopsy can be done… ever!”… were left by him plainly, personally, and free of duress. But anyone who knew he was a CIA targetted individual would truly have to be a MORON to blindly, quickly, and unquestionably believe that. Yes, his “close friends” were MORONS… or they, really, were enemies. They deny us at times our martyrs. Even as “close friends” deny the requisite duties thereof. Namely, protection of a man’s memory… as well as protection of his life.